This is an interesting book, but I’m going to try and keep this review short. I love reading over Amazon.com reviews, if for no other reason than to weed out the idiotic ones that are just knee-jerk reactionary. 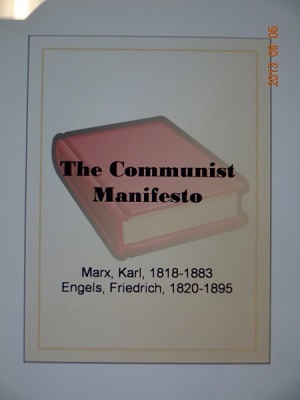 The “evil” Communist Manifesto, and how wrong Marx and Engels were in their assessment of society. Most of these reviewers directly link the Soviet Union as the “model” of what communism is, when it could not be further from the truth. Communism calls for the eventual withering away of government. The government of the Soviet Union was not “withering” in any sense of the word. What the Soviet Union (and, for a while, the People’s Republic of China) proved is that communism can be a tool of dictatorships to further control the people. It does not generate money the way these dictatorships want, which is why capitalism is a much better tool. Hitler’s control of Germany was assured when he was able to take control of the capitalist economy. The popular mode of capitalism in the United States in corporate capitalism. What is so unsettling is that Marx and Engels were able to predict many things that have come to pass 148 years before they happened . They saw big corporations exploiting the world market and creating “a cosmopolitan character to production and consumption in every country” (p. 64). The exportation of the American way of life has been one big factor in generating production and consumption based on the Western model (p. 65). Of course they blame the bourgeoisie as the motivators of this new model of production. Just who are the bourgeoisie? Basically everyone who does not work a blue collar job or who is incredibly poor and destitute. This lumps the rich and the middle class together, which doesn’t make me feel comfortable. Still, the corporate capitalism that has overtaken the United States could not have been done without the consent of the middle class, a large part of which still support it. Could communism work? No. Government is a necessary evil; it can never “wither away.” Without government, there would be chaos. There must always been an authority to fill the holes in the street, make the buses run, replace burned out traffic lights, etc. Taxes are the only way to get the money to maintain society’s infrastructure. It’s idealistic to think that humans could live without some type of government. (And no, I’m not going to pitch-in with others and fill potholes.) The ancient Greeks believed that laws—created and enforced by government—were what separated them from the barbarians. More realistically, and contrary to what Marx and Engels believed, socialism could work. It allows for the (limited) ownership of property and limits the size of private business, which would benefit society. A handful of greedy idiots could not bring down the world economy like was done in 2008. A truly pure socialist government that could exist remains to be seen. A hybrid of capitalist and socialist elements are the norm in Western Europe; even the United States has the “evil” socialism in the guise of welfare, social security, and unemployment. Health care is the one that’s missing, and it looks like it will not be added any time soon. I would never rule out Marx and Engels. What they have to say gives one pause to consider the current socioeconomic structure—and what might happen if things do not change for the better for everyone.